(Chicago) – Illinois Governor Bruce Rauner, accompanied by bill co-sponsors State Senator Kwame Raoul (D-13) and State Rep. Jehan Gordon-Booth (D-92), signed bipartisan criminal justice reform legislation at TASC on March 10. SB2872, also known as the Neighborhood Safety Act, increases trauma recovery support services for crime victims, strengthens judicial discretion to mandate individuals to probation and addiction treatment services in the community instead of prison, and expands opportunities for rehabilitative programming within Illinois prisons. Watch a video of the March 10 bill signing here, including remarks from Governor Rauner; Senator Raoul; Representative Gordon-Booth; John Maki, executive director of the Illinois Criminal Justice Information Authority; Lisa D. Daniels, founder of the Darren B. Easterling Center for Restorative Justice; and Lenore Anderson, president of the Alliance for Safety and Justice. The legislation advances recommendations of the Illinois State Commission on Criminal Justice and Sentencing Reform in its final report, including giving further discretion to judges regarding whether certain offenses may be appropriate for probation. 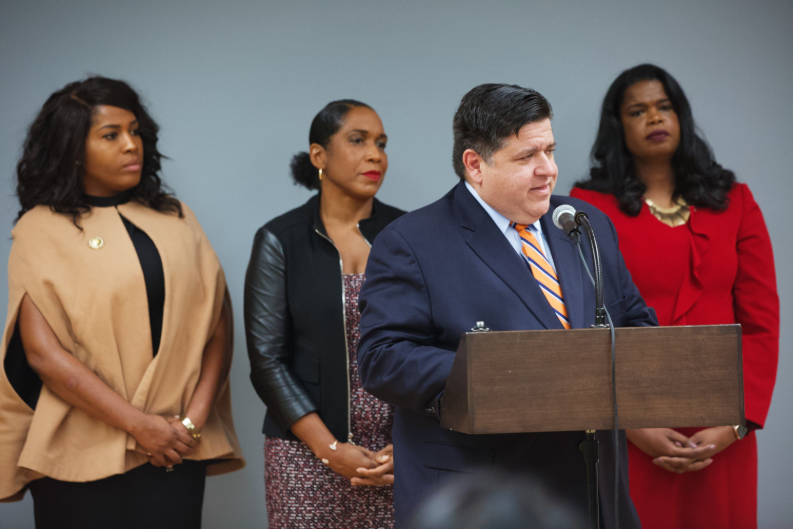 “By increasing access to rehabilitation services and alternatives to incarceration, this bill helps to support families, build communities, and reduce the number of people in prison and associated costs,” said TASC President Pam Rodriguez, a member of the Governor’s commission, which seeks to reduce Illinois’ prison population by 25 percent by 2025. 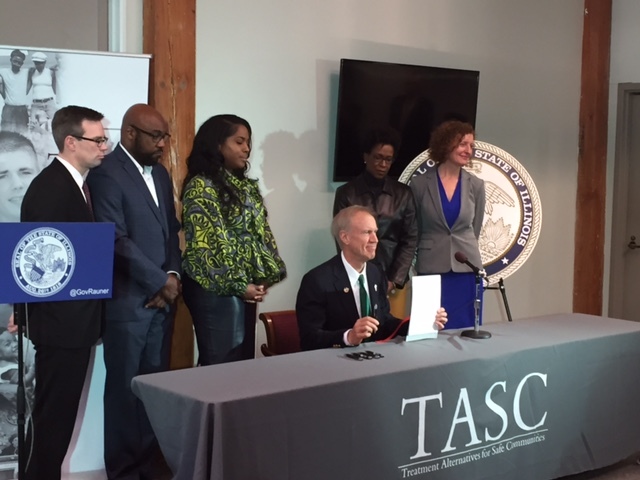 Governor Rauner signs SB2872 at TASC. Left to right: John Maki, Illinois Criminal Justice Information Authority; IL Senator Kwame Raoul; IL Representative Jehan Gordon-Booth; IL Governor Bruce Rauner; Lisa D. Daniels, Darren B. Easterling Center for Restorative Justice; Lenore Anderson, Alliance for Safety and Justice.